A close examination of the chronology of the Life indicates a number of inconsistencies. For example, Emperor Michael III, born in 840, was married to Eudokia Dekapolitissa in 855. And at the time of Irene's arrival to Constantinople, she was supposed to be a teenager. At the same time, the hagiographer reports that the emperor met her and reviewed her to be his bride, with St. Ioannikios the Great, who died in 846, when Emperor Michael would have been six years old. Also, according to some scholars, one can judge Irene's election as abbess to the period between 843 and 847. But in reality, the review of brides took place ten years later, in 855. Such chronological discrepancies causes the details of the Life of Irene to be extremely difficult to establish. According to one source, she was born in 840 and died in 940. Rosenquist dates her life between 830 and 930. The Russian Byzantinist Ivan Ivanovich Sokolov says she died in the mid-9th century. Some researchers believe that these chronological problems cast doubt on the historicity of Irene. According to an assumption of Rosenquist, who did not have strong evidence, a family member of Irene in Constantinople could have been her anonymous hagiographer. He also suggested the author could be a woman, in particular an abbess of Chrysovalantou Monastery. Furthermore, the chronological inconsistencies indicates an authorship to her Life that is much later to the events described and speaks of the author's ignorance of the history of the mid-9th century. According to some researchers, this is inevitable when we consider the fact that Irene lived to be a hundred years old. The most likely dating, therefore, of the Life is probably during the reign of Emperor Basil II (976-1025). Besides the person of Irene herself, the historical value of the Life lies also in giving us information about the role of magic in Byzantium from the mid-9th - mid-10th centuries, as well as information about Chrysovalantou Monastery. It also reports on the location of the monastery in "a picturesque place, far from crowded quarters". According to the text, the monastery was originally male; its decline and desolation resulted in a policy of persecution of monastics during iconoclasm. Before the events described, it was restored as a female monastery. 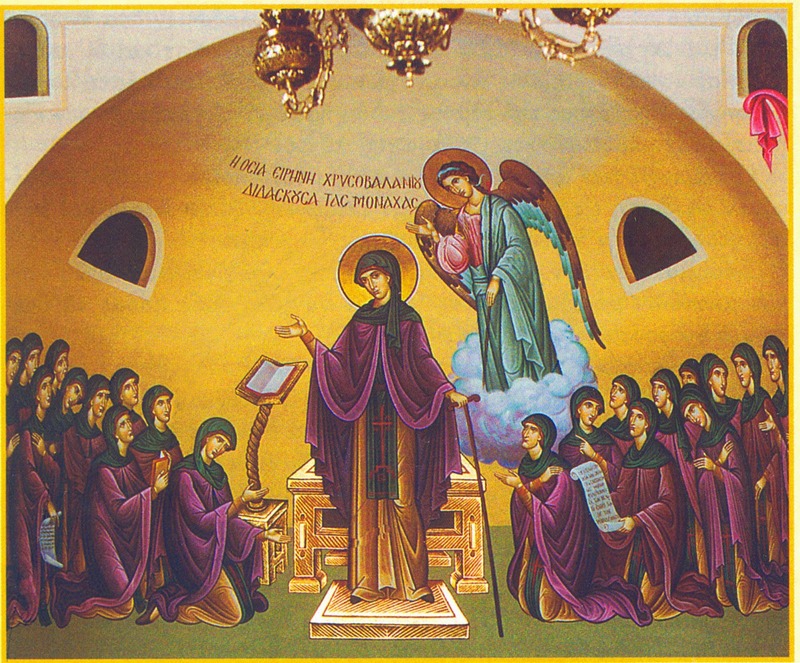 Irene, who led the monastery to prosperity, was probably, in the opinion of Sokolov, "an excellent example of the glory of monasticism enjoyed in the Byzantine society of the time under consideration". According to the Russian Byzantinist Alexander Petrovich Kazhdan, the Life serves as evidence of the great influence of the Cappadocian noble families in Byzantium of the middle of the 9th century; Irene was originally a Cappadocian before moving to Constantinople. The Life begins by describing the events that occurred just before the Triumph of Orthodoxy. Thus, it reports the death of the Emperor Theophilos, the beginning of the regency of his wife, Empress Theodora, the Constantinople Local Synod and the condemnation of iconoclasm as heresy. It further describes the entreaties of the Empress concerning the forgiveness of her husband and her request to the holy fathers, the members of the synod, to make a list with the names of all iconoclasts. The Life furthermore states that the list was laid on the altar in the Church of Hagia Sophia. After this, the prayers of the holy fathers followed to save the soul of the iconoclast emperor, lasting several days, after which the list was opened, and among the names of the heretics the name of Theophilos was no more among those listed. From this point begins the details of the life of St. Irene with the review of brides.